﻿ Romans 8:31 What then shall we say to these things? If God is for us, who is against us? What, then, can we say about all of this? If God is for us, who can be against us? What then will we say to these things? If God is for us, who is against us? What then should we conclude from this? [Just this]: If God is on our side, who can [successfully] oppose us? What, then, shall we say to these things? 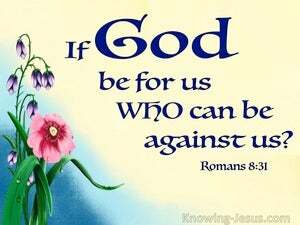 If God be for us, who can be against us? What shall we conclude then from this? 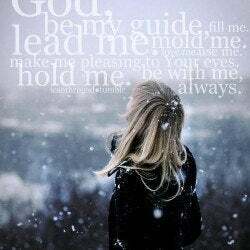 if God be for us, who can be against us? What shall we then say to these things? If God be for us, who against us? Then what shall we say to these things? If God is for us, who can be against us? Then what shall we conclude from this? If God is for us, who can be against us? What shall we then say to these things? If God is for us, who shall be against us? What then shall we say to these? if God with us, who against us? What then shall we say about these [things]? If God [is] for us, who [can be] against us? What shall we then say unto these things? if God be on our side: who can be against us? Now what follows from all this? If God is for us, who can be against us? What shall we say then, to these things? 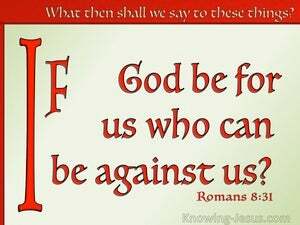 If God be for us, Who can be against us? What shall we say then to these things? If God is for us, who is against us? What, then, shall we say to a these things? If God is for us, who shall be against us? What then shall we say to these things? If God be for us, who [shall be] against us? What are we to say, then, in the light of all this? If God is on our side, who can there be against us? What then shall we say to this? If God is on our side, who is there to appear against us? What are we then to say to facts like these? If God is for us, who can be against us? What, then, shall we say to these things? If God is for us, who is against us? What, then, shall we say unto these things? if God is for us, who is against us? 30 and these whom He predestined, He also called; and these whom He called, He also justified; and these whom He justified, He also glorified. 31 What then shall we say to these things? If God is for us, who is against us? 32 He who did not spare His own Son, but delivered Him over for us all, how will He not also with Him freely give us all things?